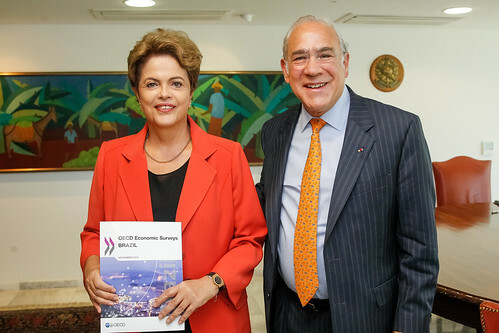 Mr. Angel Gurría, Secretary-General of the OECD, is in Brazil (Brasilia and São Paulo), from 2 to 5 November 2015, on an official visit. In Brasilia, the Secretary-General presented the OECD 2015 Economic Survey of Brazil alongside Mr. Joaquim Levy, Minister of Finance, and the OECD Environmental Performance Review of Brazil alongside Mrs. Izabella Teixeira, Minister of Environment (press release: English | Portuguese). He also delivered opening remarks at the OECD-CADE Competition Summit “Public Procurement & Fighting Bid Rigging” and at the 2nd International Seminar Governance and Development “Good Practices and the Role of External Control”, where he presented the report Supreme Audit Institutions and Good Governance: Oversight, Insight and Foresight alongside Mr. Aroldo Cedraz, Minister of the Supreme Audit Institution and Mr. Valdir Simão, Chief Minister of the Comptroller General of the Union. The Secretary-General also signed the Brazil-OECD Programme of Work (2016-2017) alongside Mr. Mauro Vieira, Minister of Foreign Affairs, and Mr. Joaquim Levy (press release: English | Portuguese). While in Brasilia, Mr. Angel Gurrí held several bilateral meetings with high-level officials from Brazil and signed documents that will see enhanced engagement with with the Tribunal de Contas da União (TCU) and the National Water Agency (ANA). In São Paulo, the Secretary-General delivered remarks at the opening session of the seminar with Federação das Indústrias de São Paulo (FIESP) on “Building a Positive Agenda for Brazil”.